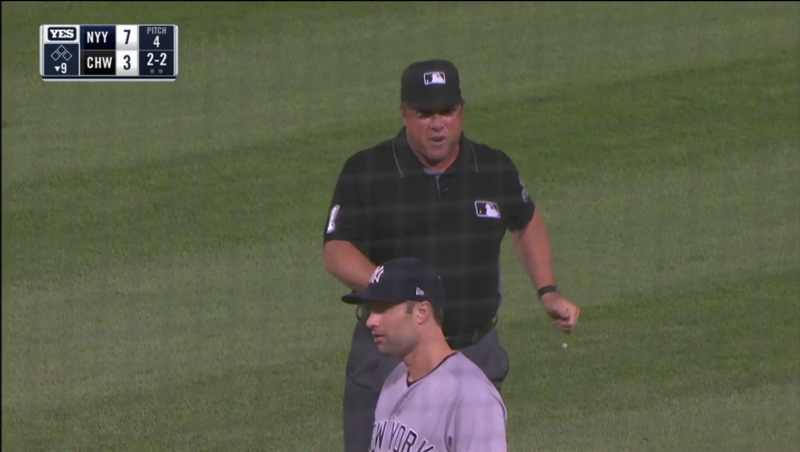 Umpires stomp on our good time and get in the way of our boys and their wins, so we yell and squawk their way, but we’d be lost without them. They’re a very necessary bummer and they normally perform their bummering quite ably. You can tell, because we have baseball at all. 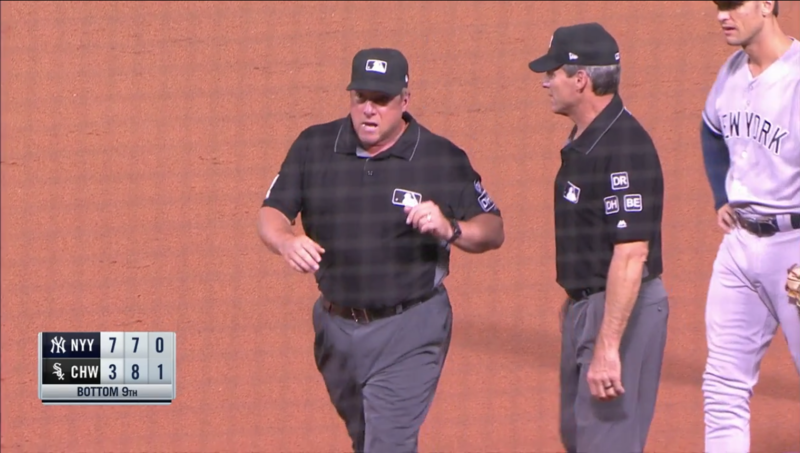 They aren’t perfect, and they have their foul-ups and biases, but if umpires were much worse at their very hard jobs, even just some medium amount worse, we couldn’t have the sport. It would offend us; it would get us down. The action on the field would grind to a halt. We’d say baseball was stupid. 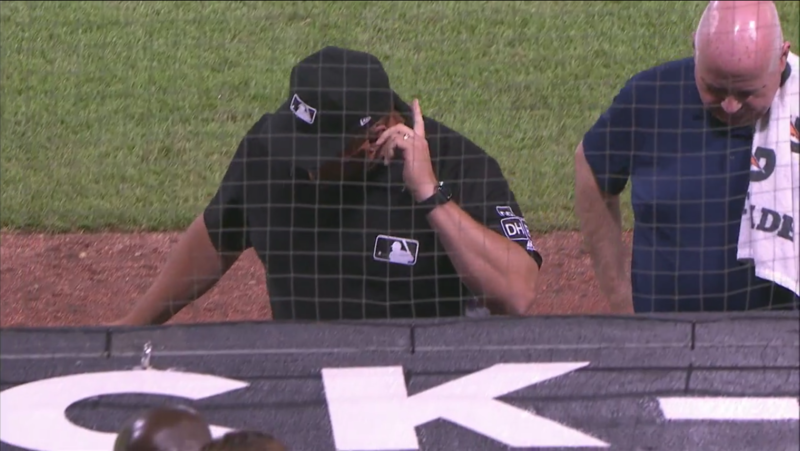 The calls, especially at home plate, have to be mostly very good mostly all the time, or the whole thing comes tumbling down. And so umpires do their very hard jobs mostly very well with very little thanks and a not small amount of jeering. And what’s more, they’re calm while they do it. That mellow is important. The job well done keeps us moving; the calm lets us believe it’s fair. The calm lets us trust it. And so they’re calm. Not perfectly so; not when the yelling and the squawking really pick up. But usually? Quite calm. 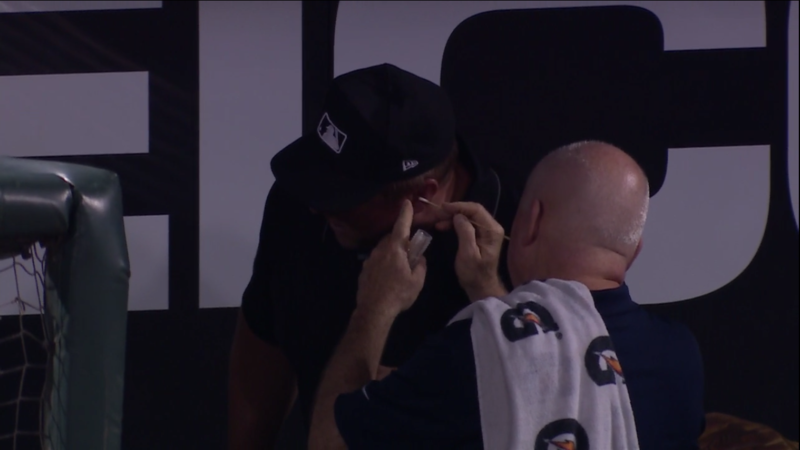 Case in point: on Wednesday evening, a bug flew into second base umpire Bruce Dreckman’s ear during the ninth inning of the Yankees-White Sox game. Here is Dreckman, running in from the infield as Jonathan Holder prepared to pitch to Nicky Delmonico. He calls for a trainer, looking vaguely stricken, but only vaguely. 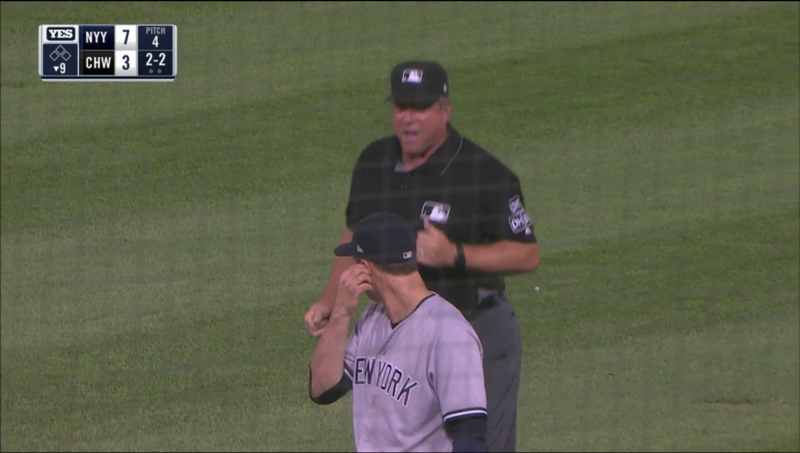 Greg Bird appears confused. What’s going on here? Well jeez, Greg, he has a moth in his ear. 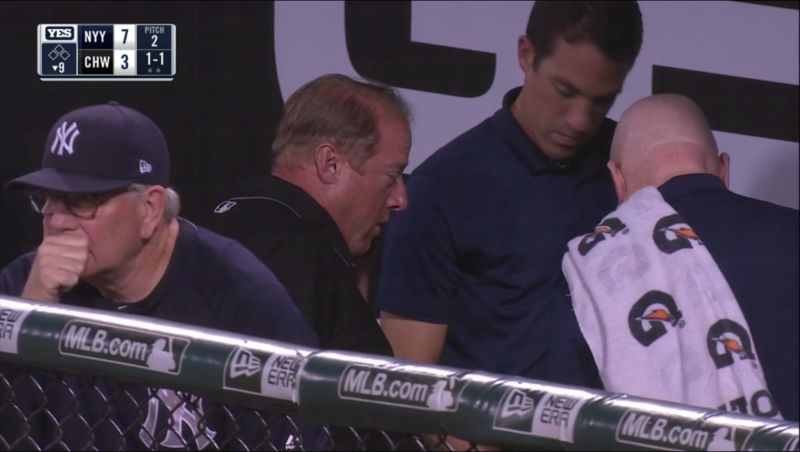 Dreckman grasps the shoulders of Steve Donohue, head athletic trainer for the Yankees. It’s moving around in there, Steve. Oh god, it tickles. 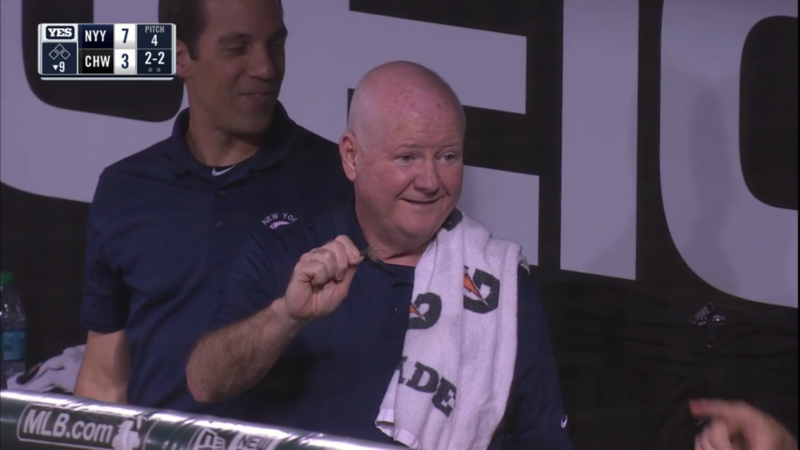 Bruce and Steve descend into the dugout, with Bruce giving his ear the little dig-and-flick of a man who has just gotten out of the pool and is unable to shake that last. little. bit. of. water. Except it is not water. It is a bug. This is the most obviously panicked Dreckman will seem, this grimace and quick trot, and the grasping of shoulders, and the flick of the ear. And look, perhaps he grew up on a farm. Maybe he keeps bees or butterflies. This could be old hat, just part of life. But I suspect it indicates Dreckman is made of some stern stuff. You’d trust him to, assuming he learned the requisite skills, defuse a bomb, or stop a bad bleed in surgery, or watch two two-year-olds at the same time. You’d assume he could render a sound judgment with the crowd roaring and a game on the line because there he stands, live bug in ear, moving around, and he has yet to run around the field in a terror or set his own head on fire. Couldn’t get it out! So these are the stakes! A future free of mothy bits, or one with some amount of mothy bits. It becomes clear that a better, grabbier implement is necessary for the task. Suddenly, this moth extraction becomes not all that dissimlar from when IKEA realized those screwy little Allen wrenches weren’t going to build anything that could survive shifting even one inch to either side, and wondered if you shouldn’t just use a drill. I mean, honestly, you’re an adult now. Use proper tools. Dreckman knows; he’s got this. He’s been to IKEA. He’s built stuff. Stuff you want to still care about! Stuff you plan to actually move to your next apartment. No BILLY bookcases for him. Bruce is calm and cool and accustomed to IKEA and accustomed to being yelled at by managers and defusing bombs and two-year-olds. He has yet to set himself on fire. He’s not about to be phased by a moth. It is in this moment, almost a full at-bat later with hardly a sweat broken, that the moth comes out. Dreckman pulls it out himself. He pulls out a living, fluttering moth, looks it full in the face, and calmly hands it to Donohue before trotting back out to work. We should, I think, take a moment to appreciate him in contrast to his fellows. 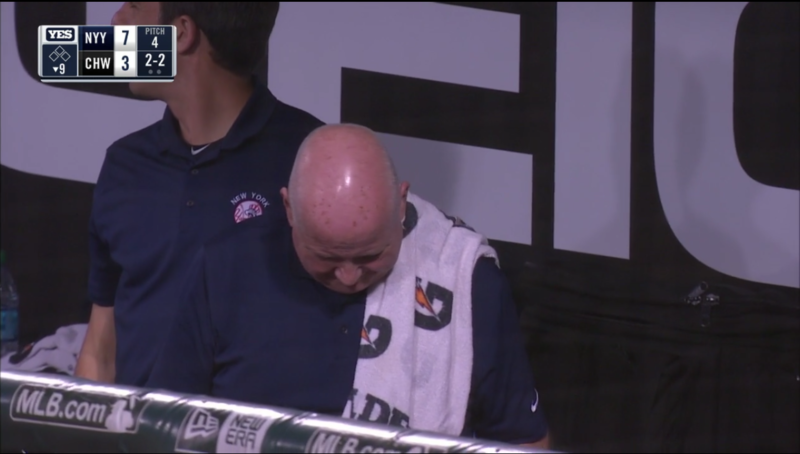 We can’t know for sure, but Larry Rothschild appears to be trying very, very hard not to throw up because throwing up will only make it worse but oh god, does he want to throw up. It’s moving around in there. In his head. Where his eyes and brain and slimy parts live. What if the antennae are sticking out, what if you can see them? And what did Dreckman do, after going back to work. 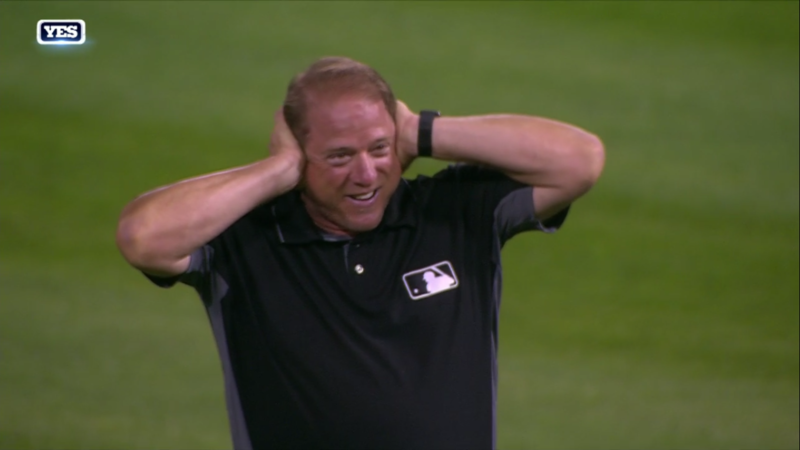 Well first, he made Neil Walker worry that he might have a moth in his ear. And it is only then that he indulges a real moment of doubt, succumbs temporarily to the flutter of phantom wings. Did I get all the little legs and specks of moth dust? This will keep ’em out. Phew. 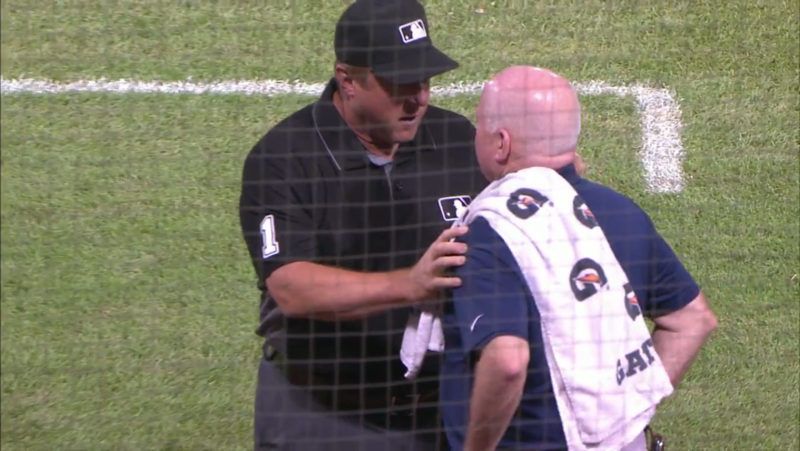 Umpires aren’t the only professionals on the field; they aren’t the only ones to do a little stoic overcoming. Players fight injury, fatigue, and failure. Trudging isn’t the sole province of the guys in blue. But like bomb techs and surgeons, they carry with them a well of patience. Of tranquil but ably done bummering, that gets them and the game through. Bruce Dreckman pulled a bug out of his own head on Wednesday. Calmly, smoothly. With the steady hand of someone who knows the rules and would apply them fairly and keep your two-year-old alive at IKEA. Even on a Sunday. We hoped you liked reading Bruce Dreckman Had a Bug in His Ear by Meg Rowley! Your articles for FanGraphs have been the chocolate milk of articles. I never knew I needed them only because I didn’t know such wondrousness could exist in the world.